Salmon on rice, also known as Nigiri, is a popular sushi dish among enthusiasts of the Japanese delicacy known for its tasty simplicity. The Nigiri Project at Knaggs Ranch is, as the name suggests, a hub for salmon-on-rice connoisseurs. But not quite as you’d think. Though the name is inspired by the sushi dish, the Nigiri Project is actually a collaborative effort working to understand and test the multiple benefits of nurturing young salmon on agricultural rice paddies in the Yolo Bypass of the Sacramento River Valley. In partnership with scientists from UC Davis Center for Watershed Sciences, government agencies including the California Department of Water Resources, and the local nonprofit California Trout, Knaggs Ranch is applying the Nigiri culinary model to the local landscape. Working together, the partners are formulating a new model of integrated management that works to balance the multiple priorities of the area, including preservation of local rice agriculture, floodwater prevention, and restoration for local fish and wildlife habitats. Two years in the making, the Project is leading the way in shifting the Yolo Bypass, and in the long run, other regions of the Central Valley, towards a new multi-use management paradigm. Once dominated by vast stretches of seasonal marshland, the Central Valley floor, including the Yolo Bypass, was historically inundated with river water during most winters. As a result, the marshlands once supported a diversity of salmon, waterfowl, and other wildlife. The gentle overflow prevented extreme floods further downstream and washed young Chinook salmon out of main rivers to off-channel habitats with abundant food resources essential for promoting growth and survival of the salmon. Over time, the construction of dams and extensive levee systems, pervasive drainage for agriculture, and withdrawals for urban water use caused a marked loss in connectivity among the marshlands, floodplains, and ecosystem health. Today, salmon are seldom able to access historical rearing habitats that were once the trusty hub for the salmon runs. In turn, other wildlife, ecosystems, and ecological diversity in the area have also suffered. The Yolo Bypass, the Central Valley’s largest remaining contiguous floodplain, continues to convey floodwaters from natural, seasonal inundations from the Sacramento, American, Yuba, and Feather Rivers, as well as their tributary watersheds. Working as a natural relief valve, the Bypass absorbs incoming floodwater in wet years and reduces the risks of flooding in populated areas, as did most of the Central Valley long ago. Knaggs Ranch, the official site of the Nigiri Project, is situated in the agricultural floodplains of the Yolo Bypass. The folks at Knaggs are working to integrate the historically conflicting issues of the region—floodplain management, agricultural operations, and space for wildlife habitat—through their collaborative Experimental Agricultural Floodplain Habitat Investigation, more cleverly known as the Nigiri Project. But Knaggs Ranch was not always so. Like most growers in the area, before mobilizing the collaborative efforts for integrated management, over 90% of the 1,700-acre land at Knaggs Ranch was dedicated solely to rice farming. However, changing hydrologic regimes of the Bypass along with strained water resources provided the critical need not only for understanding the dynamics of the narrow strip of floodplain but also for exploring new options for sustainable agriculture. In 2011, a group of researchers began a pilot study to see if agricultural lands not viable for farming could be transformed into productive rearing habitats for young salmon before they began their long journey toward the ocean. Rather than tap into already strained water resources and flood-sanctioned wildlife areas as a way to mimic critical salmon habitat, the study integrated salmon rearing into the rice growing cycles of the local agricultural operations where shallow, flooded, marsh-like habitats already existed. Led by California Trout biologist and fly-fisherman Jacob Katz and UC Davis researcher Carson Jeffres, the initial study mimicked historical salmon habitat rearing conditions, when seasonal winter flooding gave salmon access to expansive marshland across the Sacramento Valley. 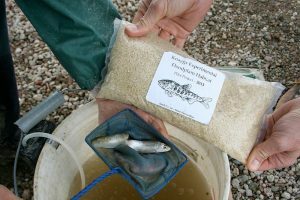 The initial pilot study, completed in 2012, compared the growth potential of young salmon that spent time on the seasonally flooded (post-harvest) rice fields with salmon that were left to rear in the Sacramento River. The “salmon on rice” grew remarkably—twice as fast as their river-feeding counterparts. Researchers also found the test salmon increased weight at an impressive speed—5.4 grams per day on average—calling the salmon reared at Knaggs Ranch “floodplain fatties.” The pilot project documented among the highest growth ever recorded in the Central Valley salmon research, indicating that there is potential for the entire Yolo Bypass agricultural floodway to foster productive salmon nurseries at relatively little cost to farmers. The second phase of the project, launched in early 2013 and planned to continue through 2014, aims to evaluate the best habitat variations for both the salmon and the agricultural operations to thrive. The goal is to find the sweet spot that maximizes juvenile salmon growth and local wildlife resiliency without disturbing planting cycles and other farm operations. Preliminary findings indicate that the salmon do not have preference among the different rice field habitats, likely owing to the generally plentiful food supply of the productive marshes. The salmon did, however, prefer habitats with better water flow. These findings suggest farm managers may have more flexibility in land treatment for salmon rearing after harvest, as long as adequate water flow is maintained. So far, according to Katz, this year’s salmon have grown about 30% bigger than in the previous year, despite one of the driest winters on record.Reduced overflow from nearby rivers has resulted in more concentrated nutrients among the experimental marsh plots, making for an even richer insect and zooplankton buffet for the salmon. The phenomenon illustrates the buffer the marshes provide for salmon resiliency over erratic climate conditions, particularly relevant in the face of climate change. Preventative flood planning by better incorporating spillways and bypasses to relieve pressure from levees. This works to protect local human populations and their property, and also provides water overflow to fallow agricultural rice paddies, creating wetland habitats for fish and wildlife. Beneficial fisheries management that promotes a thriving salmon population better equipped for ocean survival. As mentioned previously, research confirmed substantially improved body condition and growth, delayed out-migration timing ideal for ocean integration, and superior out-migration route of salmon reared on flooded rice paddies compared to the salmon of the Sacramento River. Economical land use of fallow agricultural rice paddies that promotes regeneration of the land and creates highly productive habitats that mimic historic hydraulic regimes for salmon. Climate change mitigation against erratic drought or flood conditions that could negatively impact salmon and human populations of the floodplain. The findings at Knaggs Ranch also suggest it is possible to achieve win-win-win outcomes among land-use planners, conservationists, and farmers alike. Balancing these multiple priorities not only provides innovative, low-cost adaptation solutions for addressing the uncertain future of the Yolo Bypass, but also serves as a template for other equally vulnerable areas throughout the Yolo Bypass—and beyond. Most importantly, the success story inherent to Knaggs Ranch underscores the possibilities for creatively adapting water use and agricultural practices in California as we transition into the uncertain terrain of the 21st century. For additional agricultural water success stories, explore our interactive database here. Also, be sure to stay tuned for the upcoming announcement of our next Farm Water Steward Award recipient. The Farm Water Steward Award is a collaborative effort among Pacific Institute, Community Alliance for Family Farmers, and Agricultural Innovations Network to recognize an outstanding grower who demonstrates water stewardship. Each award cycle, the collaborative selects a winner with a success story already submitted to the interactive database. For information on submitting a success story for the next award cycle, please contact annabee@pacinst.org. What species of Salmon is being raised? They are not GMO or of a DNA from a farmed species are they? I do think it’s a naturally interesting and timely project. I found the answer at the Knaggs Ranch site! Its a wonderful project of salmon renewal in the Yolo By-Pas !